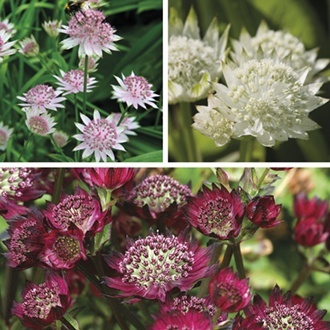 The Astrantia Collection includes the varieties White Angel, April Love and Moulin Rouge. Wonderful cottage garden plants, loved by bees and butterflies and superb for cutting. Of all the perennials available, the astrantia has to be one of the most endearing. Besides its obvious beauty and much-loved ‘cottage garden’ status, it is a tough and resilient plant which thrive not only in bright and sunny spots, but also in shady areas of the garden too. The pincushion-like flowers, each surrounded by a collar of fringed bracts, appear from June through to the end of August and are a magnet for bees and butterflies, attracted by the nectar-rich pollen. The flowers are excellent for cutting and enjoying fresh in the vase or allowed to dry and used in dried flower arrangements. Grow in moist, fertile soil (Astrantias do not like to dry out) in sun or part shade and incorporate plenty of well-rotted organic matter when planting, keeping well-watered in periods of dry weather.